After I posted this bread on Instagram over the weekend, I had no idea that the reaction would be so enthusiastic for this recipe! I’m excited to share it with you, but I didn’t have time to remake it and photograph the step-by-step instructions. So just read through the instructions so you are familiar with the steps and you’ll be fine. 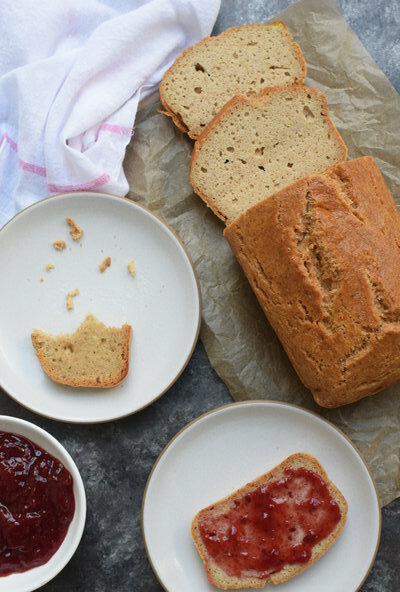 I originally developed this recipe for Clean Eating Magazine and the editors went crazy for this bread. I’m not grain-free but I really like grain-free baked goods. They’re higher in protein, lower in carbohydrates (usually) and they last longer in the fridge. Is this bread just like wheat sandwich bread? No. But it is the best grain-free sandwich bread I have ever tried. 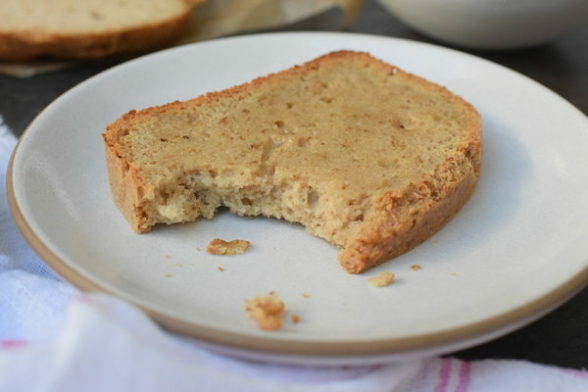 There are many that are cashew butter-based and those have a quick bread consistency, like the texture of a banana bread. No chew at all. 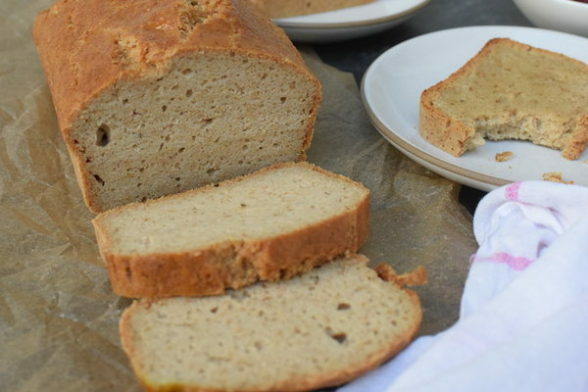 This bread has an amazing texture with a chewy crust and it toasts up beautifully. It’s also easier and faster than a yeast-based bread. The ingredients are a little random and you may not have all of them in your pantry. Sorry! But everything can be purchased at Whole Foods. If you are annoyed by all the egg whites, again I apologize. 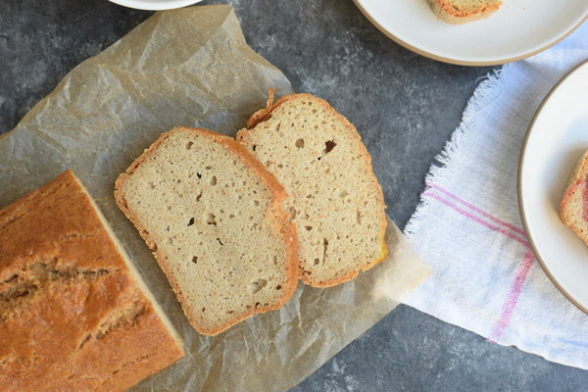 But this really is the best grain-free sandwich bread. You can use the yolks in cookie recipes, to make pudding or ice cream, or just add an extra yolk or two every time you make an omelet or frittata. Can someone who is proficient in Passover rules let me know if this recipe is Passover compliant? If so, this could be a game changer! I have to make this quick today because I am working around the clock to launch my first online cooking class. It’s reallllly close! Preheat the oven to 375 degrees. Grease an 8-inch x 4-inch loaf pan with olive oil and line it with parchment paper. Whisk together the almond flour, tapioca flour, coconut flour, flaxmeal, psyllium husk, salt and baking soda in a bowl until well combined and lump-free. In the bowl of a stand mixer, combine egg whites, olive oil and apple cider vinegar. Add flour mixture to the egg white mixture and beat on medium-low to combine well. You are not trying to whip the egg whites Pour in the boiling water and blend on medium-low speed for 1 minute. Prepare the egg wash: in a small bowl, beat 1 whole egg with water and brush over top of loaf. Remove from the oven, then carefully remove the loaf from the pan. Place the bread loaf back into the oven right on the oven rack. Bake until loaf forms a golden crust, about 10-15 minutes. Cool the bread completely on a cooling rack before slicing. Store bread at room temperature in an airtight container or wrapped well with plastic wrap for up to 3 days. Or store well-wrapped in the refrigerator for up to one week. I made this recipe yesterday, and it turned out fantastic! I didn’t have an egg for the wash (I used packaged egg whites), so I substituted a mixture of almond milk and maple syrup, and it turned out with a perfect golden crust. I want to slice and freeze – do you think it would hold up? SOrry, Monica. I have no idea! But the recipe has much fewer carbs than a grain bread for sure! I pasted recipe into Happy Forks nutrition calculator. If you break it into 8 servings there are 25 grams of carb per serving. But I haven’t tried recipe yet. So it’s just a guess on serving size. Thanks for doing that, Carrie! an 1/8th of the loaf is a pretty big serving, probably like two thin slices. That is an amazing idea to use this bread for Passover !! !And am not sure if there is a Kosher for Passover Psyllium Husk etc. for the strictly Orthodox . It seems like the issue is the flax for those who are very strict. But if you need a specific K4P tapioca starch, then that looks like it fits the bill. We are always looking for a yummy gluten free bread at our house, but can’t eat nuts. Do you have any suggestions for an almond flour substitute? I don’t think its a 1:1 swap with GF flour. Thanks! Have you tried to make this vegan? I haven’t, sorry. I haven’t had luck in the past veganizing a recipe with this much egg. If I were to try to remove the egg whites, I would start with aquafaba whipped and stabilized with cream of tartar. This looks amazing! I don’t have psyllium husk, any thoughts on possible substitutions? Also, I know you are fantastic at not wasting food…any ideas on how to use those 8 eggs yolks? It’s a pretty important binding agent here. I pulled this off of another website re: a sub for psyllium husk: “If you don’t want to use psyllium or can’t find it, you can replace it with xanthan gum but this is definitely not a one-for-one substitution. It’s more like 1 teaspoon of xanthan gum for 2 to 3 tablespoons of psyllium. You might need to add a bit more of one of the flours in your recipe to balance the ratio of wet to dry. You can use flax meal as a one-for-one replacement but add a pinch or two of extra xanthan gum to your recipe to keep your baked goods from getting crumbly. It may take a bit of trial and error in each recipe until you achieve the results you like.” You can find it for cheap at Whole Foods or online. Re: egg yolks, I wrote in the copy of the post about some ways you can use up the yolks. Yes, you are correct – I hate wasting food! Thanks so much Pamela! Sorry I missed your notes regarding the eggs! Thanks so much for posting this recipe – can’t wait to try it! Should the psyllium husk be a powder or whole? Great question! My container says 365 Organic Psyllium Husk whole flakes. It is pretty powdery, so if there is a powder option, I’m sure it would work. If you use psyllium powder, you just use 25% less than if u r using flakes.